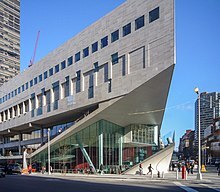 The Juilliard School (/ˌdʒuːliˈɑːrd/), informally called Juilliard it is located in the Lincoln Center for the Performing Arts on the Upper West Side of Manhattan, New York City. It is a performing arts conservatory established in 1905. The school trains about 850 undergraduate and graduate students in dance, drama, and music. It is thought to be as one of the world's leading music and dance schools, with some of the best arts programs. In 2016, Juilliard was ranked as the world's best institution for Performing Arts in their inaugural global ranking of the discipline. This page was last changed on 26 July 2018, at 08:46.